Malvika Iyer Is Really Unstoppable! She is the bomb blaster survivor but lost both hands in the deadly blast. Now the unstoppable lady had completed PhD, disability activist and a motivational speaker. She shared her extraordinary finger in her right hand that made her to type Ph.D thesis. 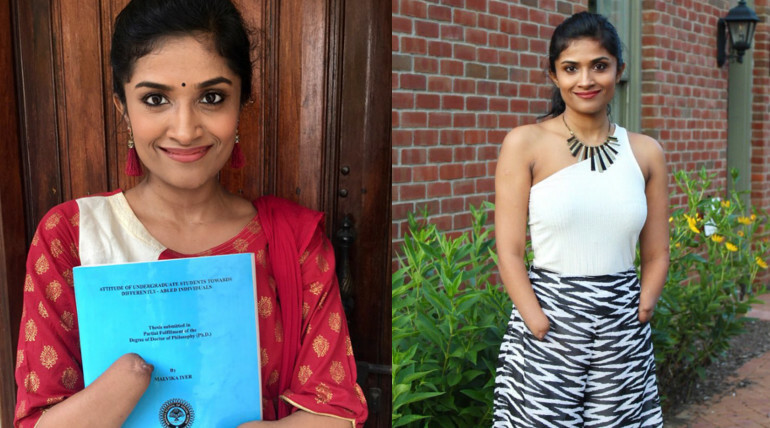 She is now Dr. Malvika Iyer and she was very excited to share it. Despite losing her hands she pushed herself in positive way and won her target. She also motivates others to fight and keep on going. She always says "the only disability in life is a bad attitude." She was born in Kumbakonam in Tamil Nadu to the couple to B. Krishnan and Hema Krishnan, She lost her both hands in a grenade explosion at her home, severely injured, fractured on legs and had nerve paralysis. She had done Master and M.Phil in social work. As a motivational speaker, she first spoke in TEDxYouth in 2013 at Chennai. Following it she had done several motivational speech across the world. PS: To everyone who’s been curious as to how I type, do you see that bone protruding from my right hand? That’s my one and only extraordinary finger. I even typed my Ph.D. thesis with it :)"